Originally from the area around Lyon, Baptiste created his eponymous domaine from scratch in 2014. Today he has just over 6 hectares of vines, which is the maximum he can farm by himself to maintain the quality he requires. The majority is Gamay in the AOP Coteaux du Lyonnais, a small rather unknown appellation on the outskirts of Lyon between the Beaujolais and the Northern Rhône. There is also a small amount of Chardonnay, also in the AOP Coteaux du Lyonnais. 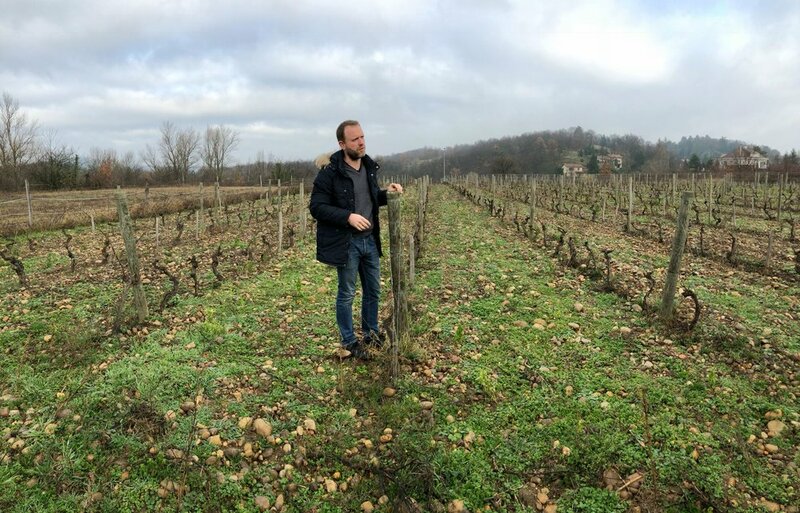 These wines have a rare excitement and energy found in the most legendary natural wine producers in France, and it will be thrilling to watch Baptiste and his wines evolve, and to taste what the future has in store. Since its inception, the entire domaine has been certified organic. The vineyard is maintained without any chemical products, pesticides, or synthetic fertilizer. The soil is plowed to encourage microbial activity. In parallel, infusions of horsetail, nettle, comfrey, and willow are used to reinforce and structure the vines during their vegetative period, and to reduce to a strict minimum the use of copper and sulfur. Le domaine also uses biodynamic methods with the constant objective to recreate the harmony between the mineral, vegetable, human, and cosmos. Vinifications are done only with native yeast, without sulfur dioxide, and without any modern oenological product. All vinification occurs without any temperature control (neither heating nor cooling), and with the objective to infuse the grape rather than to extract. As a result, there is very little punchdowns or pumpovers to respect the integrity of the grapes as long as possible and to gain the maximum finesse and complexity. Conscious of the health of our customers, we reduce the quantity of sulfites in the wine to the strict minimum to guarantee a better digestibility and an ivresse joyeuse (literally a joyful inebriation, but it sounds better in French). For full transparency, we indicate the amount of SO2 in each wine. A blend of parcelles around Millery of 30+ years old vines, glacial Moraine granite soil. Vésanie is an inspired, joyful wine that instantly brings a new definition to the appellation - think of it as cru Beaujolais meets Côte-Rôtie in the best possible way. Blend of the oldest parcels of Gamay at the domaine around Millery, glacial Moraine granite. 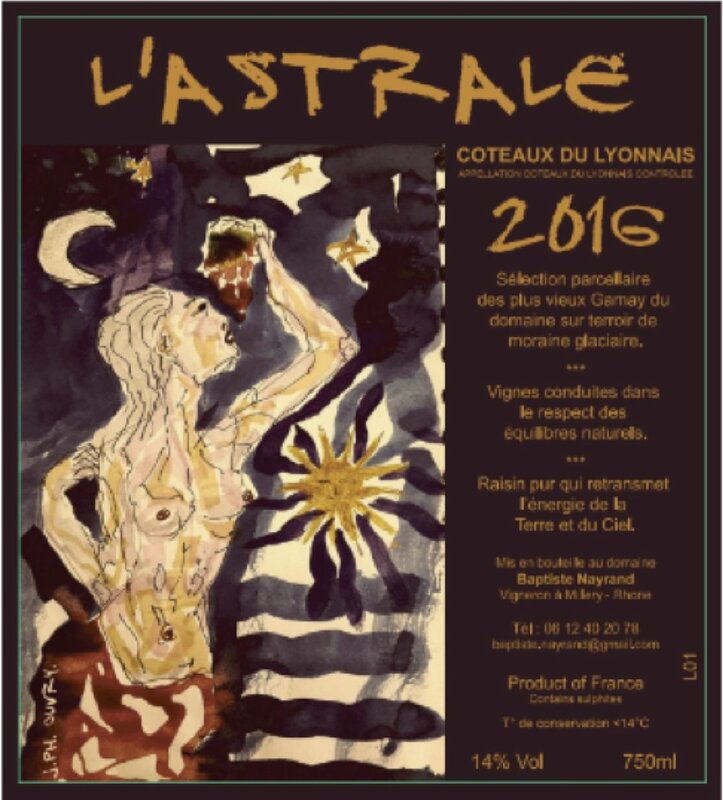 L’Astale is an unusually dark and rich expression of Gamay, perhaps inspired by the meaty wines in Côte-Rôtie just to the south, and a result of the extremely low yields from the oldest vines at the domaine. Glacial Moraine granite. Puits à Vin means the wine well, and is a term long used by locals to refer to the best parcels that would regularly produce good wines. This Chardonnay strikes a balance between intensity and acidity, and highlights the unique terroir of the Coteaux du Lyonnais.